After three straight losses to start their season, the Drexel University men’s lacrosse team came back with a huge win over Marist College. In the beginning of the season, the Dragons faced top ranked teams of No. 11 the University of Virginia Feb. 17, No. 2 the University at Albany Feb. 14 and No. 7 Villanova University Feb. 27. They returned home to host Marist College March 3 and break that streak of losses. In the three minutes of play, Marist was up 2-0 after winning the faceoff and driving down the field for the first goal and then converting after a turnover by Drexel. With 9:01 left in the first period, sophomore Matthew Varian got the Dragons on the board for his fifth goal of the season so far. About 30 seconds later, Marist came back with another goal to put them up 3-1. Junior Marshall King picked up a ground ball and started heading down the field to find Varian who made another goal a minute later. Varian was on fire as he tied the score with 3:45 to play with yet another goal. With five seconds remaining on the clock before the next period, senior Jake O’Donnell scored on a man-up play with an assist from Varian for his first goal of the season. Marist College held Drexel to a tie 4-4 in the second period before halftime as neither team could find a way to take the lead. The Dragons went into halftime with a mission: get the ball moving on offense and stop any attempts at scoring on defense. When they entered back onto the field, it felt like a whole new team. In the third period, the Dragons went on a 6-0 scoring run holding Marist 10-4 by the end of the period. Within the first two minutes of play, sophomore Reid Bowering made two goals after sophomore Jimmeh Koita won both faceoffs on violation. These were Bowering’s third and fourth goals of the season. Sophomore Nick Fox then scored three goals in a row for the Dragons. The last goal of the period came with 37 seconds left to play from Bowering to give the Dragons a six point lead heading into the final period. Drexel had outshot Marist 16-5 (9-3 on goal) in the third period, and this is what had made the difference in scoring. They had zero turnovers compared to Marist’s four, and senior goalkeeper Chre Teitelbaum saved every shot thrown at him. 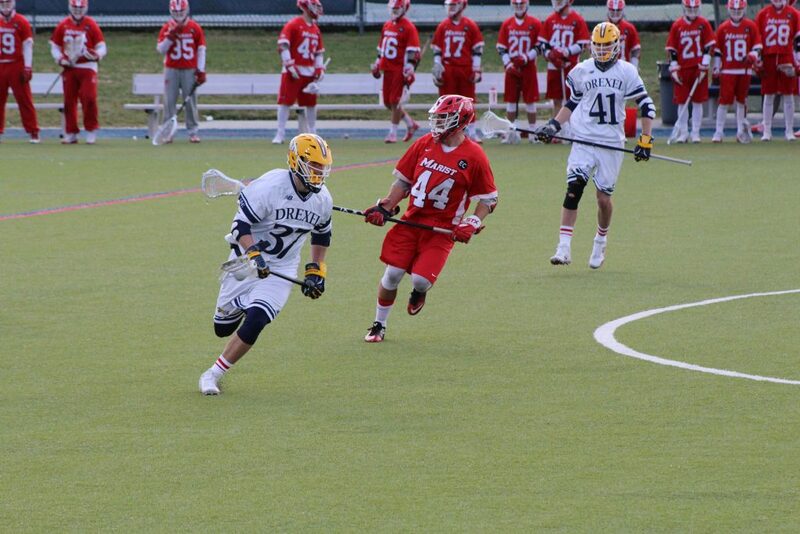 More successful plays were made in the final period as Drexel held Marist to only one goal. Senior Will Manganiello scored within the first three minutes of play followed by a goal from Bowering a minute later and a goal from Fox with 9:00 left to play. The Dragons were now up 13-5 with a clear victory in sight, but it didn’t stop there. Varian made a goal on a man-up play assisted by Marshall, and sophomore Chris McLallen gave the final word with the last goal with 43 seconds left. Three Dragons had four goals of the game — Varian, Fox and Bowering. Teitelbaum had 11 saves. The men’s lacrosse team travels to Smithfield, Rhode Island, to play Bryant University March 10 and then will return to Philadelphia March 13 for a game against Saint Joseph’s University.